Mustard is considered a priority food allergen by Health Canada. Priority food allergens are the foods that cause the majority of allergic reactions. Mustard is a plant and belongs to the Brassicaceae family which also includes broccoli, canola, cauliflower, cabbage, Brussel sprouts, and turnip. Since these plants are closely related to mustard, their seeds contain proteins that are very similar to the proteins in mustard seeds. People with mustard allergy should avoid consuming the seeds and sprouted seeds of other members of the Brassicaceae family as these are more likely to trigger an adverse reaction. Canola oil can be made using both canola seed and canola-quality mustard seed. Historically, the only product of canola that is commonly used in food is canola oil, which is normally highly refined and does not contain any appreciable amounts of protein. Because of this, canola oil is not considered to pose a risk for people with mustard allergy. While highly refined canola oils are not considered to pose a risk for people with mustard allergy, cold-pressed canola oil is less refined, can contain residual protein and should be avoided by individuals with mustard allergy. In some countries, edible oils obtained from the seeds of certain varieties of Brassica napus and Brassica rapa may be sold as rapeseed oil. While highly refined rapeseed oil is not expected to contain any appreciable amounts of protein, cold-pressed rapeseed oil may contain residual protein and therefore should be avoided by those with a mustard allergy. People with mustard allergy should not eat any food if it contains mustard or canola meal or protein, or if it contains cold-pressed canola/rapeseed oil as an ingredient. 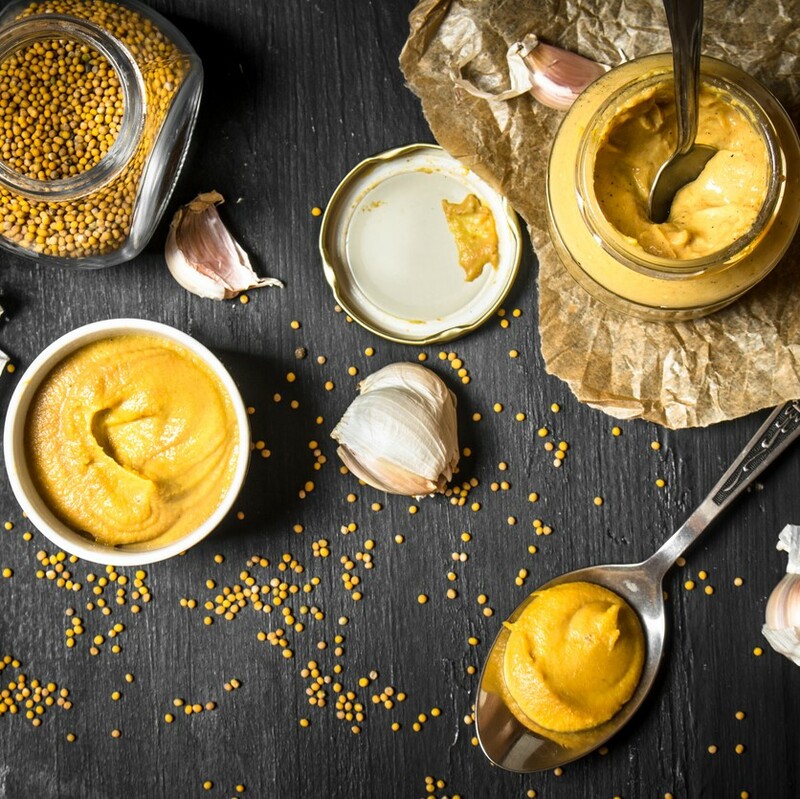 Mustard is used in many cuisines, including Indian, Middle Eastern, Eastern European, and Italian dishes. If you have an allergy to mustard, keep an epinephrine auto-injector (e.g., EpiPen®) with you at all times. Epinephrine is the first-line treatment for severe allergic reactions (anaphylaxis). Read ingredient labels every time you buy or eat a product. If the label indicates that a product “Contains” or “may contain” mustard, do not eat it. If you do not recognize an ingredient, if there is no ingredient list available, or if you don’t understand the language written on the packaging, avoid the product. For tips on eating out, visit our guide for dining out with food allergies. Be careful when buying products from outside of Canada, since labelling rules differ from country to country and the term “spice” may include mustard. Watch for cross-contamination, which is when a small amount of a food allergen (e.g., mustard) gets into another food accidentally, or when it’s present in saliva, on a surface, or on an object. This small amount of an allergen could cause an allergic reaction. Note: This list is not complete and may change.